Amanda Seyfried has identified her favourite quote from hit teen movie Mean Girls, in which she starred. 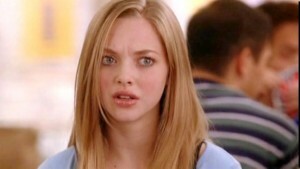 “‘If you’re from Africa why are you white?’ is the best line ever! “I feel so lucky to have been in the movie, it was a lucky break for me because it was that or college. Luckily Mark Waters took a chance and hired me in my first ever movie, and I had no idea what I was doing! And pressed on the possibility of a reunion – like in a skit for Saturday Night Live – she said: “That would be so fun, doing like an SNL skit. I would do that, but I would fear that it wouldn’t be funny! What if it wasn’t funny? The mystery is that the idea of it is sometimes better than actually following through.